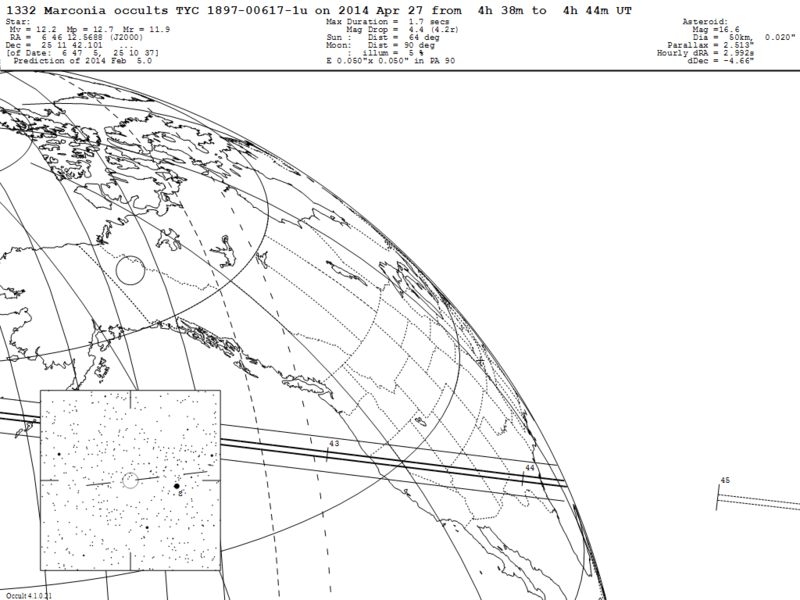 Asteroid (1332) Marconia will occult TYC 1897-00617-1u on 2014 April 27 from 04:38 – 04:44 UT (Saturday, April 26, 9:38-9:44 PM Pacific Daylight Time). The star has a reported magnitude of 12.2. The star’s position is RA: 06:46:12.5688 DEC: +25:11:42.101, J2000. The moon will be below the horizon. Nominal sense-up value for this event will be x12. The predicted shadow path tracks northwest to southeast. While original predictions placed all RECON sites withing the 1-sigma prediction for the shadow track, more recent data has tightened up predictions and moved the shadow path slightly south. Based upon initial predictions, every RECON site (from Tulelake and Cedarville to Tonopah and Bishop) was within the 1-sigma prediction for the shadow track shown below. More recent prediction has decreased uncertainties and moved shadow path southward. IMPORTANT CHECK MALLINCAM SETTINGS: Prior to this event, be sure to check that your camera settings match those describe on the Camera Page. See also a post that Marc provided over the holidays regarding Camera Performance for ways NOT to set your camera. Also, be sure to charge the power supply for the telescope and camera and charge your netbook in advance of the event. 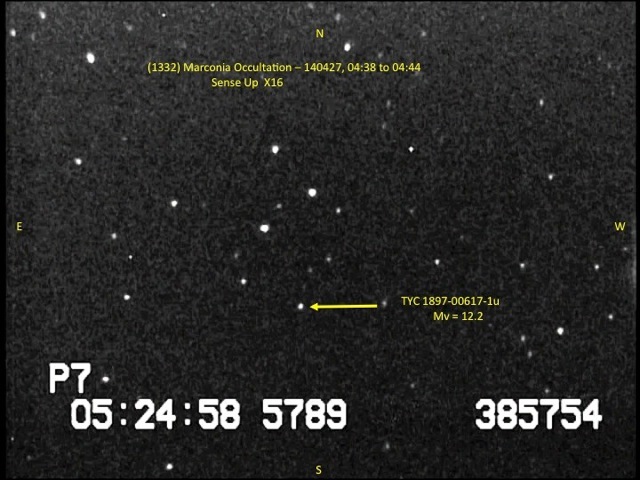 Because it takes the Mallincam time to stabilize after changing sense-up settings, we would would like those observing to be on the field and change the sense-up time by 04:38 UT (9:38 PM PDT), 5 minutes before starting to record the event. This will give the camera time to stabilize before recording data. 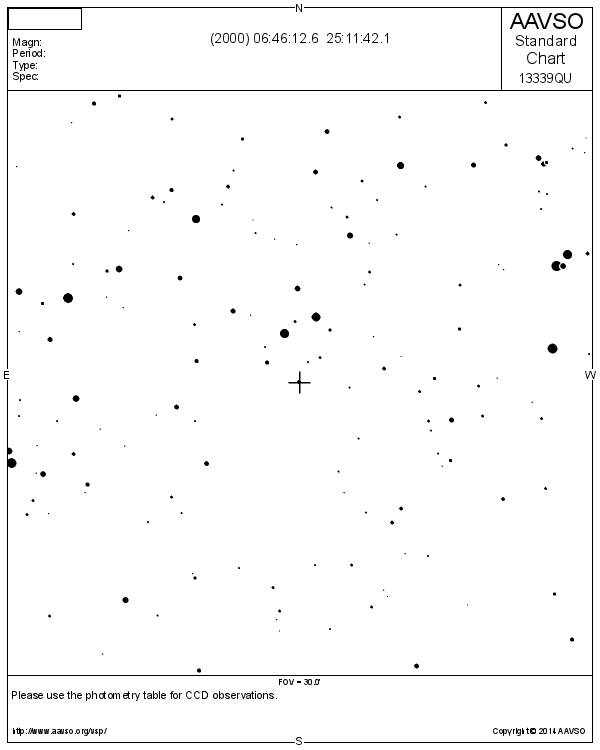 RECON sites should record from 04:43 – 04:44 UT (9:43-9:44 PM PDT). Again, you can use a sense-up of x12 for this event. The following star field was provided by Bill Gimple from Greenville.